Spring, it is getting closer believe it or not. Which means it is time to start getting those pools ready. Now that your pool cleaner has taken a beating with fall and the cold temperatures, it’s time to repair, rebuild or possibly replace. We see many homeowners take their swimming pool automatic cleaners into a shop to have them worked on, but in all honesty, having worked on them for many years they are rather simplistic to work on. So if you have a handy bone in your body, before you take your pool cleaner to a shop, take a look at it yourself. 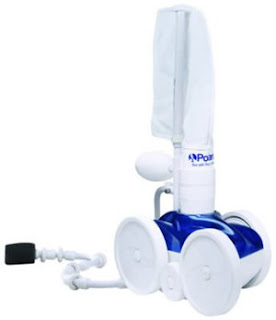 For example, one of the most popular pool cleaners is the Polaris 380. Your wearable parts that should be checked out regularly are your tail scrubber, wear rings on the tail, and tires. After that, check for leaks in the swivel connectors on the hose (small amounts of dripping is normal). One the head unit, when you spin one wheel, all three wheels should turn at the same time. If this is not the case, typically one or both of the belts are broken. Finally just a quick inspection of the belts to verify there is no fraying. Checking the bearings is as simple as checking for space within the bearing keeper and wobble. Typically if 4 or more bearings need to be replaced it is recommended to replace all of them. It may sound complicated but it is not. One concept to remember is that just because you replace the broken parts, watch for items that may be worn that might be causing other items to break. A good example for this is gear driven pool cleaners. Unlike the belt driven Polaris 380, the gear driven Polaris 180 and 280 are notoriously for this. The teeth on the wheel of the Polaris 180/280 may be torn off or flattened, but what could have caused that is the teeth on the drive shaft may be worn down causing this. One step further, is the drive shaft bearings are loose, then they could be causing both problems. This may sound confusing but in the end they are simple machines. Don’t forget Swim Clear Pool Supply has all your swimming pool cleaner parts needs from all the top brands like Hayward, Polaris, Jandy and Pentair. More swimming pool help tips to come from your swimming pool help blog.